I can’t help but love lasagna with all its gooey richness. The flavor of the sauce melds with the pasta and mingles with the cheeses and fillings, the cheese stretches from the pan to the plate as you serve it, and the sides start to collapse slightly from the weight of the hot fillings. It’s a feast for the eyes and a comfort food, through and through. If I were asked to come up with a top ten list of healthy meals, lasagna wouldn’t make the list, but there are some simple ways to make it healthier. Omit fatty meat, use part-skim cheeses, plenty of vegetables and fresh herbs, and whole wheat lasagna, and you can turn this into a relatively healthy meal to enjoy as an occasional treat. 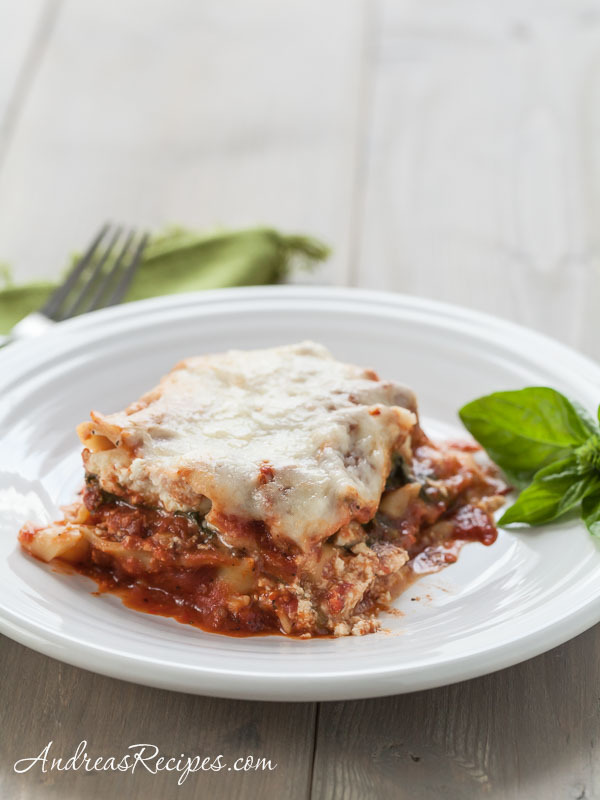 Using spinach and basil is our favorite way to make lasagna with a homemade suace from Michael’s mom, and it’s our favorite all-purpose pasta sauce because it tastes great and is easy to make. You can even make it a couple days ahead for faster prep on lasagna day. We make lasagna only two or three times a year because we consider it a treat rather than a regular meal. We usually assemble two lasagnas at once and then bake one and freeze the other for an emergency meal, which is very handy for our busy family. We have also made double recipes and assembled it in a large lasagna or roasting pan to feed a crowd. The health benefits of spinach are generally well-known, but basil is also a great source of nutrients. Basil provides vitamin C, calcium, vitamin A and phosphorus, and it also has high concentrations of carotenoids such as beta carotene. So enjoy your basil and spinach together! If you plan to use frozen spinach, make sure it is fully thawed and drain it well in a colander, pressing the spinach with your hand to squeeze out the water. Then put the damp spinach on a white paper towel and press again to make sure the spinach as as dry as possible. Wet spinach makes soggy lasagna! This lasagna recipe is my contribution to Weekend Herb Blogging, a weekly event created by Kalyn of Kalyn’s Kitchen. This week our host is Vani of Batasari. Make sure you check out the round-up on the 14th! In the pot or slow-cooker, prepare the spaghetti sauce per directions. In the medium mixing bowl, stir together the ricotta, eggs, and 1/4 cup of the grated Parmesan. Spread a ladle or two of the prepared sauce in the bottom of the baking dish. Lay down a row of 4 lasagna noodles, then add another layer of sauce. Layer on half the spinach and basil leaves, then spread on about 1/2 of the cheese mixture. It doesn’t have to look pretty, just make sure that it is evenly distributed, even if it’s in clumps. Add 4 more noodles, then a couple more ladles of the sauce. Layer on the rest of the spinach and basil, then the rest of the ricotta mixture. Add 4 more noodles, then more sauce. Sprinkle on the Parmesan and cover with foil. Bake in the preheated oven for 45 to 55 minutes. Remove the foil and sprinkle on the mozzarella cheese, then return to the oven for about 5 to 8 minutes, until the cheese is bubbly and golden brown. Remove from the oven and allow to sit for about 5 to 10 minutes before serving. To freeze an assembled lasagna, press a layer of plastic wrap down on the top cheese layer, then cover the whole pan in foil. Store in freezer for up to 1 month. To cook frozen lasagna, allow it to thaw, remove the plastic wrap and cover with the foil, then baked as directed above. Lasagna is on my To Do list this winter too. Best get to it! i can’t wait to try this one. Looks fast and easy! It looks perfect! I love basil – after cilantro, basil is my favourite of all herbs. Happy Birthday Andrea – may all your wishes come true! Suzana, thanks for the birthday wishes! I love cilantro, too. I love lasagne with spinach! It is the best way to make it – so colorful and a great way to get this healthy vegetable in! The Lasagna looks fantastic, nice and gooey and cheesy like it should be! This looks great, based on your description, I can imagine tasting it all the way here in Tokyo. What a great twist on lasagna. I love this! I LOVE lasagne, and yours looks fantastic. Saving to del.icio.us now. Hi JennDZ! I love spinach just about any way I can get it. Agreed Bradley, gooey and cheesy is the best! As a vegetarian, thank you for creating a delicious recipe…love the basil addition! OMG! this lasagne looks so delicious! Who doesn’t love lasagna? You’re so lucky to have that basil in the middle of the winter. Sounds delicious. The lasagna looks delicious! And the pix looks great!